A new generation of segmented thermoplastic poly(urethane-thiourea-imide)s (PUTIs) was synthesized via reaction of polyethylene glycol and thiourea-based prepolymer with dianhydride as chain extenders. 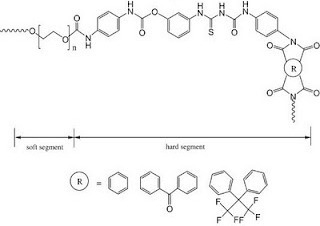 NCO-terminated prepolymer was synthesized from a new diisocyanate, 3-(3-((4-isocyanatophenyl)carbamoyl)thioureido)phenyl-4-isocyanatophenylcarbamate (IPCT), as a hard segment and PEG forming soft segment. The starting materials and polymers were characterized by conventional methods and physical properties such as solubility, solution viscosity, molecular weight, thermal stability and thermal behavior were studied. PUTIs showed partially crystalline structures. Weight average molecular weights of PUTIs (GPC measurements) were in the range of 1,68,694-1,97,035. Moreover, thermogravimetric analysis indicated that poly(urethane-thiourea-imide)s were fairly stable above 500 oC having T10 of 521-543 oC. Investigation of the results authenticated the approach of introducing thiourea (using IPCT) and imide structure in polyurethanes for the improvement of thermal stability. In comparison to typical polyurethanes, these polymers exhibited better heat resistance, chemical resistance as well as processability.